Sometimes the strangest questions come to me. In an English shopping mall, are the up escalators on the right or the left? You'd think that, since they drive on the wrong, er, left side of the road, their up escalators would be also be on the left... but I don't know if that's so. 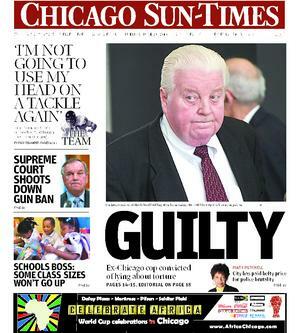 Former Chicago Police Lt. Jon Burge was convicted of perjury yesterday in a Federal District Court in Chicago. He faces 45 years in jail. Although Burge is not likely to receive so harsh a sentence, the hopes that Burge and his attorney have for a sentence of probation only are likely to be disappointed. Burge and his "Midnight Crew" of detectives at Area Two were accused of torturing confessions out of several persons accused of serious crimes. Among the most famous, or infamous, of these was cop-killer Andrew Wilson. We can't talk about Wilson's crime without first setting the scene. It was February 1982. Chicago Police Officer James E. Doyle was murdered by Edgar Hope, Jr. on February 5. Harris told two nearby police officers, James Doyle and Robert Mantia, that defendant was on the bus. The officers and Harris drove the short distance to where the bus was then stopped, near the intersection of 79th Street and Lafayette Avenue. Harris identified defendant and pointed out where he was sitting, at the back. The two officers boarded the bus; defendant was searched briefly. As Officer Doyle was following defendant toward the front to remove him, defendant suddenly turned and fired a handgun. He shot and killed Doyle and then fired at Mantia, who was at the back of the bus searching another person. Two passengers on the bus were also injured by Hope's shots. Doyle's partner ultimately ran Hope down and took him into custody. It is a fact that, sometimes, policemen in big cities, like Chicago, are killed in the line of duty. But -- thankfully -- it doesn't happen very often. But we're talking about February 1982. Andrew and Jackie entered a house [to burgle it] and came out with clothing, a TV, a fifth of whiskey, some bullets, and a jar of pennies. They were driving south on Morgan in their brown Chevy Impala when gang crimes officers Fahey, 34, and O'Brien, 33, pulled them over. Both brothers had outstanding warrants for bail violations. Andrew stripped Fahey of his gun, shot him in the head, and then shot O'Brien five times. The brothers sped off. O'Brien was dead on arrival at Little Company of Mary Hospital. Fahey died the next day. Jon Burge was in charge of the investigation into these murders. And the Wilsons were arrested, tried and convicted. [After his arrest, Wilson] spent the day in police custody; during the afternoon he was placed in a lineup, and beginning around 6 o'clock that evening he gave a statement, transcribed by a court reporter, in which he admitted shooting the two police officers. Later that night the defendant was taken by the police to Mercy Hospital, and witnesses there observed some 15 separate injuries on the defendant's head, torso, and right leg. The defendant was examined at about 11:15 p.m. by Dr. Geoffrey Korn. Dr. Korn testified that he made note of some 15 separate injuries that were apparent on the defendant's head, chest, and right leg. Two cuts on the defendant's forehead and one on the back of his head required stitches; the defendant's right eye had been blackened, and there was bleeding on the surface of that eye. Dr. Korn also observed bruises on the defendant's chest and several linear abrasions or burns on the defendant's chest, shoulder, and chin area. Finally, Dr. Korn saw on the defendant's right thigh an abrasion from a second-degree burn; it was six inches long and 1 1/2 to 2 inches wide. Dr. Korn testified that as he prepared to suture the defendant's head and face wounds, he saw that Officer Mulvaney had drawn his service revolver. Fearing that the defendant's reaction to the shots of anesthesia might startle the officer, Dr. Korn asked that the weapon be holstered. Mulvaney refused to put the gun away, however, and the doctor therefore left the room. Officer Ferro then went in the examining room and soon came out, explaining to the doctor that the defendant was now going to refuse treatment and would go to a different hospital. Dr. Korn testified that he attempted to persuade the defendant to agree to treatment but that the defendant would not change his mind. At 11:42 p.m. the defendant signed an “against medical advice” form indicating his refusal of treatment, and Officers Ferro and Mulvaney then took the defendant away. Although each and every police officer called denied that Wilson was ever beaten or tortured, the Illinois Supreme Court threw out Wilson's convictions, agreeing with Wilson that the State failed to show that his injuries were not inflicted in the course of forcing him to confess. I recall these events, not because I was there (I am not now, and never have been in, law enforcement) but because I was an adult, residing in Chicago and paying attention to the news. I paid attention, too, to what people said. What people said at the time was that it was remarkable that Wilson had survived: Cop killers had a tendency to be killed while resiting arrest. On remand, and without use of the tainted confession, Andrew Wilson was again convicted of killing the two policemen. See, People v. Wilson, 254 Ill.App.3d 1020, 626 N.E.2d 1282 (1st Dist. 1993). Meanwhile, though, a cottage industry was born. For awhile it seemed that every person convicted of a violent crime on the South Side claimed that Burge and his detectives tortured them. I remember seeing anti-Burge sentiments scrawled on the subway walls. Then-Gov. George Ryan (himself now in prison) cited the torture allegations as one of the reasons for commuting all death sentences in Illinois in 2003, shortly before he left office. (He pardoned four individuals at that time, obviously believing their claims that their confessions were coerced by torture.) And you may have read about the lawsuits. Civil suits against the City, brought by alleged torture victims, have cost the city millions over the years. It is testimony in some of these suits that formed the basis of the perjury charges of which Burge has now been convicted. Perjury is just a fancy term for lying under oath. Sad to say, I believe that people lie under oath all the time, every single day, in depositions and courthouses all over the country. There aren't enough judges and courtrooms and jurors to handle all the perjury claims that could be brought. In the real world, however, criminal perjury prosecutions are as rare as hens' teeth. Criminal perjury prosecutions claiming that the defendant lied in civil proceedings are rarer still. I don't much care for selective prosecutions. On the other hand, even without the jury's verdict to confirm it, there certainly are facts to support the conclusion that Mr. Burge may have lied about some interrogation tactics employed on his watch. But I am equally convinced that not all of Burge's "victims" are victims at all. Some -- maybe even some of those who have obtained money from the City of Chicago in settlements or in court -- may have just copied from the Andrew Wilson template. There are, however, no charges pending, or even contemplated, against any of these. Dealing with the worst people in the world -- murderers and rapists -- must be dispiriting. The temptation for overworked officers to take shortcuts -- to stoop even to torture -- must be intense at times. In the superheated atmosphere following the cold-blooded murder of three fellow officers in one week's time, that temptation must have been particularly intense. Burge and others at Area Two seem to have succumbed to this temptation, at least on some of the occasions they were said to have done so. What Burge and his associates forgot was something my mother often told me: Two wrongs do not make a right. The problem with being a lawyer and a blogger is that, sometimes, the need to tend to my law practice requires that I not spend time here. I can seldom talk about matters on which I'm working -- as you would expect -- and a lot of my day to day issues, problems and frustrations get... well... repetitive. My computer is old. And slow. How many posts can you put up about that? I have issues with money. In this economy, who doesn't? Credit card interest rates are outrageous -- sure -- but how times can you write how the government bailed out the banks with our money and, now, the banks are paying back the government with our money? So, rather than trot out an old warhorse, I thought I'd share with you some of the things I've NOT been doing while I've NOT been blogging. I've not been sailing round the Isle of Wight with Tony Hayward. 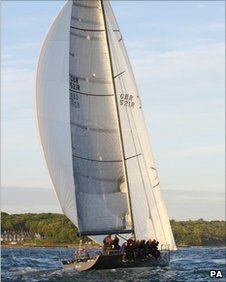 Apparently BP's Tony Hayward likes a fresh ocean breeze now and then because, as soon as he could get away from America, he went sailing with his son "on his $270,000 (£182,000) Farr 52 racing yacht, 'Bob,'" at the JP Morgan Asset Management Round The Island Race. Of course, I wasn't there only because my yacht hasn't come in yet. A lot of people are waiting for their ship to come in; at this point, I'd settle for a dinghy. 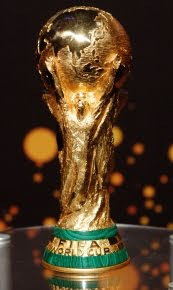 I haven't been watching the World Cup. I haven't been sitting in Judge Zagel's courtroom watching the Blagojevich trial. This Tribune photo shows Rod Blagojevich and his wife Patti getting out of a giant SUV at the Dirksen Building on their way to another day of the trial. Patti once ate a giant bug while living in tropical jungle as a contestant on a reality show. Rod was supposed to be the contestant, but Judge Zagel wouldn't let him leave the country for the for the shooting. The Blagojevich trial will be interesting today as the lawyers try and concentrate on the testimony while trying to read the Supreme Court's opinion this morning in Skilling v. United States. That link will take you to 114 pages of opinions, concurring opinions and a dissent -- but, cutting to the quick, the court held that the "honest-services statute," 18 U.S.C. §1346, proscribes only bribes and kickbacks. Blagojevich is charged under this statute. Jeffrey Skilling, by the way, the Skilling of Skilling v. United States, is the former Enron CEO and the brother of beloved Chicago TV weatherman Tom Skilling. Whether Blago will benefit from Skilling is to be determined. But Conrad Black, or Baron Black of Crossharbour, as he is known to his closest friends, the man who looted the Chicago Sun-Times and inflicted wounds on that newspaper that may yet prove fatal, unquestionably has benefited from today's decision in Skilling. See, Black v. United States, also released by the Supreme Court this morning. 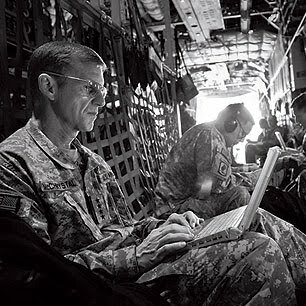 A profile of the general, in Rolling Stone, will likely mark the end of the military career of General Stanley A. McChrystal. This is not about Mr. Obama. Good heavens, one can agree with General McChrystal that the White House is staffed by "wimps" and still realize that McChrystal, in uniform, serving at the pleasure of the President of the United States, has no business voicing that opinion. Civilian control of the military is just too important to America -- too important to America's past, present, and future -- to allow General McChrystal to remain in command. The story about the linked Rolling Stone story is that McChrystal was to be profiled by the author in connection with the general's appearance at a Paris dinner. Generals sometimes have to go to fancy dinners, even when they have a surge operation to run. The plan was that the author, Michael Hastings, would go his way afterward and McChrystal and his staff would return to Afghanistan and the war. But Mother Nature had other ideas. McChrystal, his party, and Hastings were all grounded by the volcano in Iceland and forced to spend additional time together. Some of the more imprudent quotes were apparently gathered at a much less formal outing than the Paris dinner, at an Irish pub in Berlin, for example. According to this MSNBC post, Hastings' two days with the general turned into a month -- and, in that time, McChrystal and his staff (particularly his staff) seem to have 'let their hair down' a bit in Hastings' hearing. In the Civil War, General William T. Sherman (among others) wanted to shoot all reporters as spies, saboteurs and traitors. It should be embedded in the military DNA that no good comes of talking frankly to the press. It is not news that McChrystal and his staff have no great affection for the Obama administration (though, ironically, Hastings reports, McChrystal claims to have voted for the man). But the officer in uniform has an obligation to his country and to the troops he leads to keep his trap shut. He can unleash all of his political opinions in a memoir -- after he resigns. In theory, Mr. Obama can merely dress McChrystal down today, when the two are scheduled to meet. He can agree to accept his apology and they can both move on. But Mr. Obama should only do this if he is absolutely convinced that no other officer in the U.S. Army can do what General McChrystal was ordered to do in Afghanistan... and, if that's really the case, things are much worse than we know. No, General McChrystal must go. Aside to no one in particular: I remember when Rolling Stone could make or break records -- not four-star generals. When I practiced with a firm, assignments came largely from the senior partners. This was true for junior partners and the greenest associates alike. We juniors had supervisory responsibilities for new hires. We were to shepherd the youngsters through their tasks and, of course, make sure they hit their billing targets. We were evaluated by the senior partners on how well the new kids performed. The new hires were also evaluated by the senior partners; we juniors lacked the authority to hire, fire or even discipline. I thought associates should consider why an assignment should be done and question whether there were other ways of accomplishing the purpose. Should we really answer the complaint -- or was there a basis on which to move to strike or dismiss? Would that merely educate the other side or might it result in a quick disposition? Associates, though, were quite literal: The senior partner said prepare an answer and deny everything. Why are you asking me to do something different? Yes, there were form interrogatories even then -- though not yet prescribed by the Illinois Supreme Court -- but that didn't mean form interrogatories should be served in every case. What are we looking for here? What do we expect to get? What does the investigation suggest in terms of customized questions? I wanted each of my new charges to go through this analysis in every case. Each new charge, in turn, realized that there was only so much time that could be billed to the task regardless of the thought process -- so that should be eliminated. I had associates tell me, with a straight face, that they wanted to "have a life" -- to be able to go home at the end of the day and enjoy the world beyond the office walls. Yet, I was doing my work during the day and re-doing their work at night and becoming increasingly angry and frustrated. And I was "eating" a lot of time: I couldn't bill for doing what was already "done" and I couldn't cut the youngsters' time too savagely even though I'd shredded their output. And, no matter what I did, I was a lousy supervisor -- the kid wasn't productive enough -- I was doing too much myself -- I couldn't "delegate" -- or (my favorite) I was "too hard" on the youngster. Now, I'll tell you what this diffused management system was really all about: The senior partners did not want to be burdened with looking at rookie work product -- but they didn't want to give up control over the kids either. Everyone knows the old cliche about lawyers being control freaks. I know I am. But the senior partners at my old firm took control issues to ridiculous lengths: They wouldn't allow anyone else to open the morning mail. Seriously. But they came back to me as I read about the disastrous BP oil spill. Unlike their competitors, BP liked to hire their exploration work out -- thus Transocean and Halliburton were running the Deepwater Horizon when it blew up. [B]y mid-April, the well seemed a qualified success. BP was convinced it had found a lot of oil. Until engineers in Houston could make plans to start pumping it out, the workers on the nearly complete well, in a standard practice, would plug it and temporarily abandon it. One of the final tasks was to cement in place the steel pipe that ran into the oil reservoir. The cement would fill the space between the outside of the pipe and the rock, preventing any gas from flowing up the sides. Halliburton, the cementing contractor, advised BP to install numerous devices to make sure the pipe was centered in the well before pumping cement, according to Halliburton documents, provided to congressional investigators and seen by the Journal. Otherwise, the cement might develop small channels that gas could squeeze through. In an April 18 report to BP, Halliburton warned that if BP didn't use more centering devices, the well would likely have "a SEVERE gas flow problem." Still, BP decided to install fewer of the devices than Halliburton recommended—six instead of 21. BP rejected Halliburton's recommendation to use 21 "centralizers" to make sure the casing ran down the center of the well bore. Instead, BP used six centralizers. In an e-mail on April 16, a BP official involved in the decision explained: "It will take 10 hours to install them. I do not like this." Later that day, another official recognized the risks of proceeding with insufficient centralizers but commented: "Who cares, it's done, end of story, will probably be fine." The lawmakers also said BP also decided against a nine- to 12-hour procedure known as a "cement bond log" that would have tested the integrity of the cement. A team from Schlumberger, an oil services firm, was on board the rig, but BP sent the team home on a regularly scheduled helicopter flight the morning of April 20. Less than 12 hours later, the rig exploded. Anyway, the problem here is not unlike that in my old firm -- if you put people in charge of something, you have to let them be in charge and do it their way. If you merely pretend to put people in charge, but undermine or overrule them at every decision point, bad things will happen. Good news from the Gulf! Walruses spared! The company did have a plan, titled "BP Regional Oil Spill Response Plan -- Gulf of Mexico," approved by the federal government. But on closer inspection, it was a pretty flimsy document. 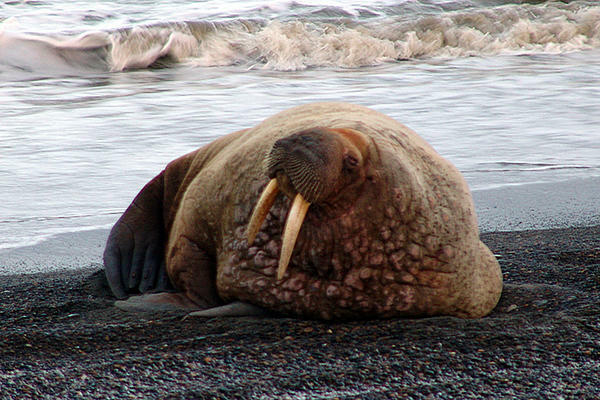 Rick Steiner, a marine biologist and former University of Alaska professor who has worked on numerous oil spills... points out that the plan discusses the need to protect walruses, seals and sea lions, animals that do not exist in the gulf, which strongly suggests a cut-and-paste-job. A Web address given for a response contractor's equipment list goes instead to a Japanese shopping site. The good ol' boys at the MMS [Minerals Management Service of the U.S. Department of the Interior] may not have been closely reading this plan when they signed off, suggests Steiner. 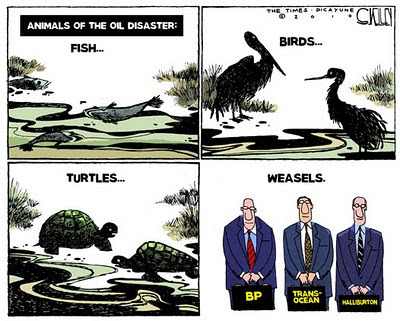 Professor Peter Lutz is listed in BP's 2009 response plan for a Gulf of Mexico oil spill as a national wildlife expert. He died in 2005. Under the heading "sensitive biological resources," the plan lists marine mammals including walruses, sea otters, sea lions and seals. None lives anywhere near the Gulf. The names and phone numbers of several Texas A&M University marine life specialists are wrong. So are the numbers for marine mammal stranding network offices in Louisiana and Florida, which are no longer in service. Read the entire article; it's enough to make anyone sick. President Obama was quoted in the Newsweek article as decrying the "cozy relationship" between oil companies and Interior's MMS. In view of the government's "oversight" of the BP disaster plan, approved just last year, that seems a huge understatement. Are we hiring poli sci majors to regulate petroleum engineers? Where are our in-house experts? When we speak of the revolving door between industry and government, are we taking only lobbyists in? Don't scientists ever come over as well? Like all the oil companies, BP has made billions -- billions -- just in the past couple of years as gasoline prices soared to new heights. Weren't any of those profits reinvested in serious assessment of the responsibilities that BP and the other oil companies have taken on? -- have begged to take on? But blogging should not be all negative. That's the mainstream media's angle. The Blogosphere should be a happier place. So let's close with the same positive where we started, shall we? The walruses are safe! Koo koo kachoo. BP graphic taken from this site. Walrus picture taken from linked Christian Science Monitor post. Long Suffering Spouse's younger sister has been married twice before, both times to the same man -- but they divorced a second time a few years back and, this time, the break appears final: He married someone else a year or two ago; now my sister-in-law is planning her own independent march down the aisle. "Long Suffering Spouse's younger sister" is too long a moniker, even for one as long-winded as me. So we'll call her "Josephine" for purposes of this discussion. Josephine met her fiance on-line through some Catholic dating network. A few of you may be scratching your heads at this: You may recall that we're Catholic -- and the Catholic Church does not permit divorce and remarriage. But the Church does sometimes issue annulments -- kind of a religious mulligan -- that says, in effect, that the prior marriage didn't happen. The children born of such a non-marriage are not stripped of their legitimacy -- which must surely be a relief to my nieces and nephews. Josephine and her husband-to-be have both been divorced -- but both have had their prior marriages annulled and are free to remarry in the Church. I understand Josephine is buying a new white dress for the occasion, which is now set for the 4th of July weekend. The oldest of her four children, a college student, will give her away. Of course not. If everything were all hunky-dory, why would I write about it? Why would you read it? The problem is that Josephine's pending husband creeps out Josephine's mother -- my mother-in-law -- and both of Josephine's sisters, one of whom is my Long Suffering Spouse. What makes this particularly remarkable is that my wife and this other (older) sister haven't spoken in over a decade. These two wouldn't agree that the sky is blue: If one were to stake out that position, the other would deny it with her dying breath. I've met the prospective husband two or three times now during Josephine's whirlwind courtship (they've gone from that first exchange of emails to the altar in about ten months, as near as anyone can tell). As an in-law, my opinion is entirely irrelevant, but I will admit that he strikes me as a bit much. I'm not given to hugging strangers; I'm not given to hugging close friends. I know and like some people who carry on like that, but I keep them at a distance. This guy is a hugger. As my pen name suggests, I radiate hostility even on my best days, so Josephine's husband-to-be didn't try to hug me -- but, when he shook hands, he patted the top of my right hand with his left. The first time he went to my mother-in-law's house he felt obliged to straighten all the pictures on her wall. And his past seems... incomplete. His first marriage failed over 20 years ago. He has one (or is it two?) adult children from that union. He's at least 15 years older than Josephine; he's in his early 60s -- and he looks like he's about 40. But if he's so all-fired interested in marriage now, why hasn't he taken the plunge sooner? Josephine's new beau lives in an Eastern state; Josephine has traveled frequently to visit, and he has come into Chicago frequently as well. Josephine came to Oldest Son's wedding last month (her youngest was the flower girl, a duty she had performed for Older Daughter as well) -- and spent most of the reception sitting outside talking on her cell phone to her fiance. Two and three hour phone conversations may still be the norm for love-struck teens... but doesn't it seem odd for persons who are three and four times 15 years old? Josephine has a good job and three of her four children are still quite young. The world is not always a nice place and there are too many scary people living in it. Josephine's mother and sisters are worried. There is absolutely nothing concrete to point to... but all of their instincts are on alert. But even if they loved Josephine's husband-to-be, her wedding would still be a big pain. Look: The 4th of July weekend is prime baseball tournament time. Youngest Son hardly played on the varsity this year as a junior. His only meaningful game experience (and his only hope of landing a place on a college baseball team) is going to have to come from his performance in summer tournaments. We won't even be in the state that weekend. I submit that we're talking apples and oranges here. I went to Josephine's first wedding; she went to mine. In my book, that makes us even. (My wife went to Josephine's second wedding, too.) If Josephine wants to start venturing into Elizabeth Taylor or Zsa Zsa Gabor territory, that's her business. I can be happy for her -- but I feel no particular obligation to attend. The kids' weddings are entirely different. It would be a snub if I refused to go to the weddings of my nephews and nieces, given that Josephine extended herself to come to her own niece and nephew's weddings. But Josephine's children will marry sometime in the future, perhaps even the distant future -- not next month. Josephine will not be satisfied with our attendance at the nuptial Mass. She wants us to come and dance the Macarena at her reception, too. My wife is adamantly opposed -- and we are going to have to leave a tournament to drive four or five hours to attend the Mass as it is. Now Josephine is texting my daughters, trying to get them to go to her reception. Older Daughter lives in Indianapolis. She is just starting a new job -- and (not surprisingly, given her age) already had nine weddings to attend this summer. Either she or her husband are standing up in several of these. Why do people insist on taking what should be a happy occasion into a power play? The Chicago Blackhawks are on the verge of winning their first Stanley Cup since 1961. All they have to do is win tomorrow night in Philadelphia (where they've not won since 1996) or Friday night, here, in Chicago. There's tremendous enthusiasm for all things Blackhawk at the moment here in Chicago. City Hall and the County Building are festooned with Hawks flags; there are Hawks banners hanging on the streetlamps. The Chicago Tribune is publishing a special Hawks-only sports section; the tabloid Chicago Sun-Times (from which the accompanying photo was lifted) is running wraparound Hawks sections on and following game days. And the local "newscasts"? If you're a hockey fan, you're in hog heaven right about now -- but, if you're trying to find out what may be happening in the outside world, you have to pay careful attention. The actual news is doled out in eyedropper-sized doses in between extended Blackhawks features. This blanket coverage is not limited to the local NBC affiliate either (NBC has most of the Stanley Cup games). All the stations are posting reporters in bars and outside the United Center, in nursing homes (these residents remember 1961 like it was yesterday! And that fella sitting quietly in the corner remembers 1938, too! ), in nurseries (all the newborns are getting red blankets... or little hockey sticks... or something)-- any place where a hockey angle might be exploited. A visitor planted in our midst might understandably assume that all of us are consumed with Blackhawk fever. But I don't think I'm alone on this: I'm happy for the hockey fans, and I'm sure this is good for the city -- but I haven't become a hockey fan all of a sudden. I never was a hockey fan. When I was a kid (and the Blackhawks were good) I tried to become a hockey fan. I listened to radio broadcasts by Lloyd Pettit long enough to 'get' Bruce Wolf's later imitations -- but I never quite figured the game out. I tried again in college. My school had a club hockey team and I went to a few of the games. I didn't understand it any better live and in person than I did over the radio. That doesn't mean we haven't watched any hockey in the Curmudgeon home during these playoffs. Surprisingly, Long Suffering Spouse has wanted to see some of the games. The kids in her school were becoming increasingly enthusiastic as the Hawks went through the playoffs and she was curious to see what all the fuss was about. A little hockey, though, goes a long way. "Don't they have any rules in this game?" she asked after watching a series of particularly violent collisions. As near as I can tell, hockey is sort of like soccer -- another game I don't get -- only on skates and with sticks. I'll tell you how little I know about hockey: My wife asked me how many players were on each side, and I confidently answered "six" -- and quietly confirmed that fact with Wikipedia. There are all sorts of people who are hockey fans today in Chicago who couldn't have cared less about hockey just a couple of years ago. For many of these people, "hockey puck" was just an insult wielded by Don Rickles. 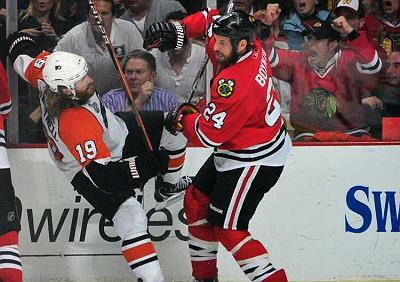 Blackhawks hockey was irrelevant in this town until Rocky Wirtz took over the team after his father's death in 2007. For a number of years, the minor league Chicago Wolves hockey team (affiliated with the NHL's Atlanta Thrashers) were arguably more popular than the Hawks. Not only were their tickets cheaper, their home games were available on cable -- the Blackhawks refused to allow telecasts of their home games until Rocky Wirtz took the helm of the franchise. The Blackhawks story resonates because it is a story of new blood invigorating a moribund franchise, with exciting young athletes coming into full flower at exactly the right moment. The bandwagon is rolling. But it's still hockey. I'm really much more concerned, even now, with the White Sox's erratic pitching and failure to get timely hits. Why is this team underperforming? But that's a different post. So... I hope the Blackhawks get to hoist Lord Stanley's Cup. It'll be nice. I'll probably watch some of the game tomorrow and everything. But I'll not be trying to crowd onto the bandwagon. Sure... some of you may begin to think I'm pulling a Johnny Carson... cutting back my blog work-week by eliminating all Mondays... pretty soon I'll have Joan Rivers guest blog... can we blog?... but, honest, this morning, I really did try and sign on and post. It's too late today for me to put up the post I had in mind when I signed on this morning... I am actually trying to work this afternoon... but I want you to know, just this once, it wasn't my fault! After Memorial Day in the U.S., many offices adopt a "Casual Friday" for the summer. The office dress code is loosened. Ties and jackets, for example, are discarded for "business casual." Of course, like any good thing, Casual Fridays can be carried too far. Just how far, however, I did not realize until this morning when I was on the Chicago Sun-Times website. I saw a tease for a story about "Naked Fridays at at work." Always eager to learn and report on new social trends, and without any trace of prurient motive whatsoever, I clicked on the link above. Apparently the web editor at the Sun-Times is a little backed up, because today's little gem actually appeared in Britain's Telegraph on July 2, 2009. The original article, by Ben Leach, describes the efforts of a "business psychologist" who persuaded the staff at a design and marketing firm in Newcastle upon Tyne "that a Naked Friday idea would boost their team spirit." According to the article in the Telegraph, the business psychologist told the staff that "by stripping off their clothes, staff could also strip away inhibitions and talk to each other more openly and honestly." You know, I may have tried similar lines once upon a time. Probably got slapped every time, too. But I was no doubt too far gone in drink to remember clearly. Which is surely just as well. Anyway, although I was surprised to see that the staff went along with this proposal (as the accompanying picture appears to confirm), I was less surprised when I read that the "experiment" had been "filmed for a one-off TV show, Naked Office" that was shown last year. I hope our British readers can fill us in on how well the show did. Are sequels planned? I was unable to find out whether the show will be screened on BBC America anytime soon. Mike Luckovich cartoon obtained from Yahoo! News. The headline on Yahoo! this morning made me burst out laughing: BP says unprepared for Gulf spill; pipe awaits cut. Steve Breen cartoon obtained from Go Comics. The real lesson to be learned from this nightmare is not that government is the enemy. Neither is it that government is our friend. Government is the neutral that provides a level playing field, that balances the needs of the fishermen and tourist industry against the needs of the greedy, opportunistic robber barons, er, oil industry. At least, it should be the neutral.... Regulation should not be cozy... but neither should it be overly punitive. It should prevent screw-ups... and provide some serious consequences when screw-ups occur anyway: Call me overly punitive if you will, but I want to see someone thrown in jail for this. Another lesson we can learn from all this concerns the variety of animals in the Wild Kingdom. Some creatures will suffer more from this than others. Steve Kelley cartoon obtained from Chicago Tribune. Gosh, I wish it were the weasels, too. I mentioned yesterday that I'd been up late Monday finishing an appellate brief. As I grow older, late is increasingly early. I used to be able to work all night, in college and for some years after. At first I was fueled by cigarettes and coffee; later, after kids started to arrive, only by coffee. Now, I can't drink so much coffee either. So, on Monday, after working all weekend, late -- really, really late -- was 1:00am. But one thing hasn't changed. After I really push the envelope to finish something, staying up as late as my body will let me, I function fine the next day. Maybe it's because I'm running on fumes or adrenaline -- but I get through the day somehow. But the next day -- the day after the day after the night before -- that's when I crash and burn. I'm a smoldering ruin right about now. And I have May timesheets to complete. I'll be lucky to stay awake all morning. But before I get to those, let me tell you about yesterday. I knew yesterday was going to be a washout in terms of billing. Writing the brief is a billable task. Getting the people who hired you to write it to read and approve it is not. And yesterday morning I still had to prepare the Appendix to the Brief -- including copies of all the documents that needed to be included. In Illinois, that must include the Notice of Appeal and a copy of the orders appealed from. But there's usually a few other documents that one wants the court to find without having to call for the record. Selecting a dozen or so particularly important pages from a 3,000 page record is (I would argue) something of an art. When these are selected, they have to be numbered. I'd selected them long before finishing the brief. But I hadn't numbered them... or inserted the page references in the text of the brief. In Illinois, the Appendix must also include an Index to the Record. I put that after the pages I want the court to see, so I never know how the Index will be numbered. The lawyers who hired me for this brief had a clerk who was perfectly willing to insert the page numbers if I'd explain how to do it -- but it was easier for me to just do it and be done. I was able to hand off the task of getting the brief copied, bound and filed to the other firm, however. At least I think they filed yesterday. I also had an Amended Complaint that had to be filed in one of my declaratory cases. I'd gotten leave to do that on Friday, but I asked the judge if I could defer the actual filing to yesterday and he said 'no problem.' Although the pleading was prepared, the voluminous exhibits had to be copied and then hole-punched so the final documents could be assembled. Not a billable task -- but just the sort of thing that one can do after a late night while waiting for another client's approval to file an appellate brief. All of this would have gone much faster if the computer had been working -- don't worry: I won't launch into that rant again -- so I was running somewhat behind schedule at lunchtime when Long Suffering Spouse called. Did I mention yesterday was Tuesday? Tuesday, lately, is when I drive to work and leave early. I drive to work to pick up the recycling that the cleaning people bring in for me -- if I let it go much longer than a week I can't walk to my desk without turning sideways. I leave early on Tuesdays to pick up my wife from school. We have two cars -- but I have two children still at home. For Long Suffering Spouse or I to use a car takes practically an Act of Congress. Lately traffic has been terrible in the middle of the afternoons on the outbound Kennedy and, no matter when I leave, my wife winds up walking home. We don't live far. But I still have to leave early... and sit in traffic... because Younger Daughter needs the family van to get to her job which starts at 4:00pm. And the other car? That's almost exclusively in the custody of Youngest Son, who drives from baseball to football to baseball, to travel baseball, back to football -- it's not football practice in the summer, but there are lots of "camps." We don't see much of Youngest Son these days. His mother and I have taken to leaving him notes: We put these by his car keys figuring he'll at least have a chance of looking at them this way. Sometimes he tells us when he needs gas. So there was enough going on yesterday -- consider all the foregoing to be prefatory, if you will -- when Long Suffering Spouse told me that Oldest Son had texted her. Younger Daughter would be home, I replied, "but I don't want her driving them into the City if that's what he's getting at." Oldest Son and his wife have taken an apartment in a very nice, very congested area of the City, very near downtown. Younger Daughter has no experience driving in heavy city traffic. Long Suffering Spouse considered the wisdom of my statement and was, presumably, on the point of overruling me when she announced, "Hold on, I got another text. I don't know how to look at it without hanging up, so I'll call you back." A moment later the phone rang. It was Long Suffering Spouse. She seemed happier. "They missed their connecting flight," she said. "Now they won't get getting in until around 2:30." It's not that Long Suffering Spouse wants to see her son suffer in an airport in some strange city; it's just that she wanted him to get a ride home from someone in the family. "We'll see," I said, knowing full well that I still had all these things to finish that I'd mentioned earlier. At this point, I'd made copies of my Amended Complaint, but hadn't done the Notice of Filing or the Alias Summons or the cover letter or the mailing labels. I needed new return address labels too. And I was still awaiting client approval on the appellate brief. But things fell into place fairly well. My computer was working by this time. There were printer jams, of course, because the equipment knew time was of the essence and it was the printer's turn to bollix things up. Still, not ten minutes after 2:00pm, I was in line at the Daley Center waiting to get my Alias Summons sealed. I texted my wife: Maybe I can get out of here by 2:30, I wrote. I copied Oldest Son on the text, too. Oldest Son texted 15 minutes later. "We just landed," he wrote. I called back. I'd been first in line when I sent my optimistic text. I still was. One of the people in line was a pro se... who had to be walked through every step in whatever he was doing. The other was a clerk for a high volume filer. The Circuit Court Clerk has a limit on how many cases you can open at a time without making an appointment. Whatever the limit is at presently, this young man was right at same. So I waited. And I still had to place the summons for service with the Sheriff's office. And the Clerk won't accept no-fee filings over the counter any more. You have to get in a different line for a self-serve machine. In theory that saves time for the other people in the fee line. Yesterday, I wasn't interested in theory. "I'm afraid you'll just have to take a cab," I told my son. "I probably still won't be out of here even by the time you get your luggage." "If our luggage was even put on the plane," he said. "There's that, yes," I said. Well, we can skip over the exact questions that Oldest Son asked about the availability of the other vehicle. Youngest Son was at home at this moment, in between baseball practice and football camp, but he had to be back at school (as far as we knew) by 5:00. And Younger Daughter had to be at work at 4:00 and she's a good half hour away from her place of employment. I could do the math. I could see this was impossible -- not if we were to get everyone else where they were supposed to be when they were supposed to be there. But I'm also not stupid. This close to 2:30 I realized my wife would be almost through with school. This is the last week of school. Surely she wouldn't have to stay late today. So I mentioned this to Oldest Son and asked him to get his luggage and call back. Long Suffering Spouse really wanted to drive the new couple home from the airport. I knew that at lunchtime. And so she did -- even though she had to stay later at school giving make-up tests to people who were absent last week. And my wife actually got to use the other car! Younger Daughter was 32 minutes late for work (I eventually picked her up, after fighting through traffic); Youngest Son was 15 minutes late for football practice (and 45 minutes late for the offense meeting that had preceded the official practice that he'd failed to tell us about). I was in the van for over two hours. The recycling still is. * No, "Abby" is not the actual name of Oldest Son's new bride. But I'm going to have to start giving assumed names out as the size of our family keeps getting bigger. I finally finished this long term project I'd been working on. Or that I was talking about working on. That I was planning to work on at some point and moaning about in the meantime. I worked all weekend in fact -- except for an hour and a half at the Memorial Day Parade in the neighborhood (in the rain) -- finishing up at 1:00am or so, smugly satisfied that I had done my best with the material provided. Despite myself. I emailed everything off to the attorneys who hired me and went to bed. Minutes later, or so it seemed, I was in the office again, firing up the old computer. I've mentioned before that my office computer is old. If it were a Greek citizen it would almost qualify for a government pension in that country. In real time, not in dog years. Which is not to say that my computer is a dog. No, my computer is a fine, trustworthy friend and ally (it reads everything I type, you know) and I would never say disparaging things about it. In fact, Friday, before I left, I gave it and the peripherals the long weekend off. I shut everything down. A Memorial Day present to Mother Earth and to my machines. The doggone, er, lovely machine did a very convincing imitation of a paperweight for an extraordinary amount of time. I got Solitaire open after about about 20 minutes. But I couldn't get online. I couldn't even re-boot in the nice, polite, normal way. So I shut the darn thing off. I pushed the button. That made the re-boot take forever as it ran through the blue screen of maybe-this-time-it's-the-big-one... but, as you can see, I got here. After a solid 90 minutes. Isn't it always the way this works with machines?